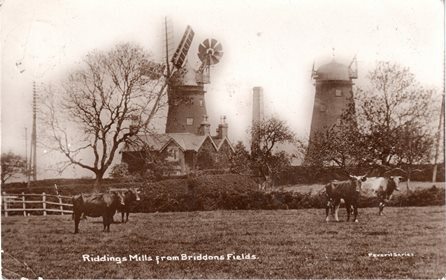 Dennis Lemons grew up at Riddings Windmills. His father was the miller there from 1926 until it closed as a mill in 1948. Dennis was always popular at school because all his school pals loved going home with him to play Cowboys and Indians in the hayloft. Dennis remembers the day in WW2 when a spitfire flew low between the mills and the night they climbed to the top of the mill to see the glow in the sky from the bombings at Sheffield. When the mill stopped operating the local Air Training Corps used it as an HQ and a small Avro aircraft was kept in the old shed there. Dennis’s first marital home was at Palmerston Street, Westwood and then later he and his wife moved to Main Road, Jacksdale. Lots of lovely memories of Westwood and Jacksdale shopkeepers. 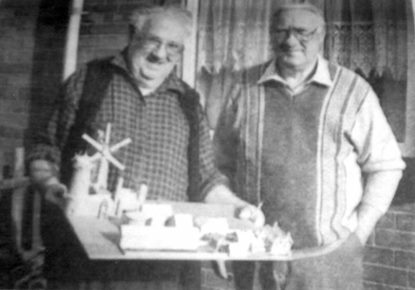 Photo Below: Dennis Lemons, far right, with his brother and their matchstick model of Riddings Windmills.